Despite being out for nearly three years, Skyrim continues to be played and well-loved by tons of folks—especially by those willing to dive into its bewildering modding world. 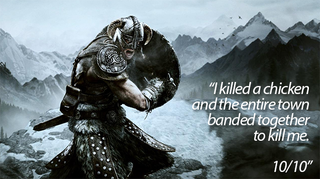 Given that, it might not be surprising to hear that a ton of Skyrim's reviews on Steam are actually sort of recent. Lots of people are still getting lost in Skyrim's world, lots of people are still taking on too many sidequests and trying their best to kill Lydia. You see this appreciation reflected in the funny and sometimes absurd Steam reviews for the game. If nothing else, Steam reviews allow us to see some of the weird obsessions people take on when playing the game. Skyrim has a knack for bringing out everyone's weirdness. I'll admit, I'm tempted to re-install Skyrim and give it another whirl. I never got to play the game with mods, so really, you might say its like I've never played the game at all. You can check out more Skyrim Steam Reviews here, or view more of our "As Told By Steam Reviews" features here. To contact the author of this post—especially if you have awesome stories of mystery or dedication—write to patricia@kotaku.com or find her on Twitter @patriciaxh.